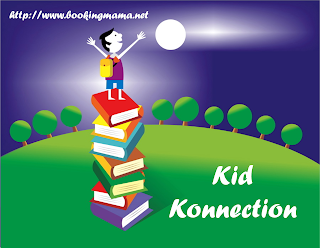 Booking Mama: Kid Konnection: Mathtime Books! Every Saturday, I host a feature called Kid Konnection -- a regular weekend feature about anything related to children's books. This week I'm going to share with you two educational books about math! 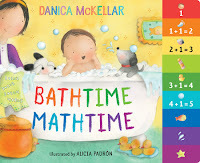 Summary: New York Times bestselling author Danica McKellar makes bathtime squeaky clean and sneaky smart fun in this original board book that gives your toddler a head start on learning math. Take one messy baby, two busy feet, three rambunctious friends, four wayward ducks, and five floaty bubbles–and get a tubful of fun as one family’s bathtime routine turns into a nightly ritual they can “count on”! 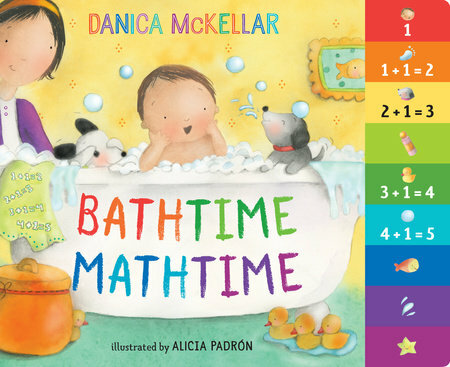 BATHTIME MATHTIME by Danica McKellar (from The Wonder Years fame!) and illustrated by Alicia Padron is a wonderful board book that is a great way to get your little one thinking about math and counting. This little picture book is adorable with its sweet bath time illustrations but it's also very educational and uses the concept of "count on" to teach simple addition. My kids used to love books with counting and numbers, and BATHTIME MATHTIME would have a sure-fire hit. Toddlers will love counting the feet, pets, ducks and bubbles while realizing that 3+1 is like counting from 3 to 4. I also think they will have fun using with the tabs on the side of the book to quickly reach the specific counting pages. BATHTIME MATHTIME is a winner! Highly recommended as book to introduce simple counting to babies. Summary: New York Times bestselling author Danica McKellar is back with a fun and accessible introduction to the essentials of math. Addition and subtraction are as easy as 1 + 2 = 3 in this funny and educational book that will have readers embracing math instead of fearing it. Finally, a FUN book to read with kids that helps bridge the gap between what’s being taught in school and how today’s parents learned math back in the day. Giggle your way through entertaining lessons on addition and subtraction involving muffins, turkey sandwiches, kittens, googly eyes, and more! Actress, math whiz, and New York Times bestselling author Danica McKellar uses her proven math techniques to give children the solid grasp of addition and subtraction that will be key to their success and unlock their potential in the classroom and beyond! Danica McKellar is back with yet another great addition to her series of math books. 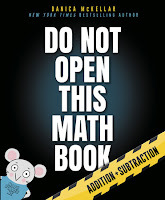 This one is aimed at kids ages 6 to 9 and is called DO NOT OPEN THIS MATH BOOK. The former childhood actress is definitely making the most of her love of math and numbers, and I am so glad she's sharing that love with kids through books! DO NOT OPEN THIS MATH BOOK is so cute that it's sending the exact opposite message... and I'm sure that was the intent. This soft cover book should be interesting even to those kids who don't exactly like math. The book is entertaining and funny, and kids will have so much fun that they won't even realize they are learning how to do math. 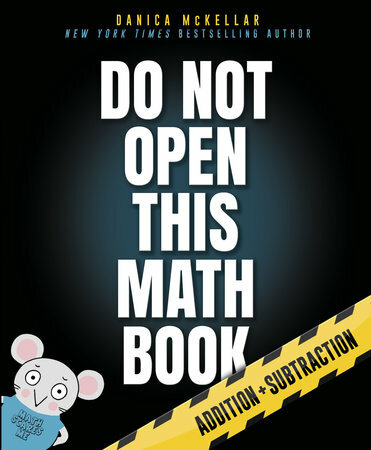 DO NOT OPEN THIS MATH BOOK has adorable illustrations, lots of color, and even a cute guide named Mr. Mouse. It also includes lots of math problems about fun things like muffins, cats, and sandwiches. What makes this book so special is that there are fantastic explanations which will help both parents and kids with various math concepts that are being taught in classrooms across the country. I can't rave enough about DO NOT OPEN THIS MATH BOOK! It's a must have for home and school libraries. These would have been a hit at our house, too. I love educational books that are fun.